It was great good luck the house escaped damage that August morning; had the fire been discovered just a few minutes later the big roof could have been engulfed and quickly after that, the entirety of the landmark home which would later become known as Comstock House. The item appearing in the Santa Rosa Republican was maddeningly brief and vague. Apparently someone spotted flames coming from the chimney during the night and sounded a fire alarm, also waking Mattie and James Wyatt Oates. Firemen arrived and put out the blaze with a handheld fire extinguisher combined with another one provided by Oates. The incident seems to have left the Oates' shaken, as discussed in the following post. Chimney fires were a serious concern in that era, when almost all buildings in residential areas had wood shake or shingle roofs. Not only could a structure burn quickly, but flying embers could set afire nearby buildings, destroying neighborhoods and even entire cities; the 1923 Berkeley fire saw nearly 600 homes burn in a few hours as wind-whipped flames raced over rooftops. Towns like Santa Rosa were particularly vulnerable because at the time of the Oates fire, Santa Rosa firefighters were no better equipped than they were during the 1906 earthquake, still using the same old horse-drawn wagons. When there was a real conflagration – such as the 1910 Levin Tannery fire – the Santa Rosa Fire Department had to rely upon citizens to volunteer their automobiles and swiftly ferry gear and crew between the station house and scene of the blaze. All that was about to change later in 1911, thankfully. The city fathers, who shamefully went on the cheap in building the post-earthquake firehouse, were now willing to put a few bucks towards modern firefighting tools, including a gasoline engine fire truck. The Knox truck dealership was vying for the sale and brought their latest model up from San Francisco. While demonstrating the machine's bells and whistles, a real fire alarm sounded in the Cherry street neighborhood. Firemen with the horse-drawn steam fire engine were quickly on their way. Not one to miss a great sales opportunity, the company rep invited the city councilmen and SRFD chief Frank Muther to jump aboard and head for the action. Despite the driver not knowing Santa Rosa streets and taking a much longer route, the truck still reached the fire ahead of the horses. "The conflagration was a small one, but was quickly put out by the Knox chemical," reported the Santa Rosa Republican. "After the fire the members of the city council were taken for a ride about town." Deal closed, eh? It was certainly a boffo demo, but a few months later the town chose instead to buy a Pope-Hartford model fire engine, which was a better known make. Like the Knox, it was technically a "Combination Chemical and Hose Wagon," which meant that it had tanks that could mix on the fly "carbonic acid gas" (AKA carbon dioxide) to smother flames. The Press Democrat article transcribed below gives a pretty good description of the truck's features, but additional details and a side photo can be found here. Their Pope-Hartford fire truck was delivered in mid-December, driving up from the Petaluma wharf in less than an hour, thanks to its powerful 50 horsepower motor. Apparently the frenzy over its arrival was so great that a car hit their mascot Buster in front of the firehouse. "He was run over and killed by a careless auto driver who had the entire street, and yet would not get by without killing Buster," lamented the Press Democrat, noting the pooch was "a favorite with all who have occasion to visit the house or pass it regularly." As the Fifth St. PD offices were directly across the street, the writer undoubtedly had first-hand knowledge of the deceased. The new fire engine finally brought the Santa Rosa Fire Department into the Twentieth Century and just a few months later, there was another page turned when SRFD chief Frank Muther retired. Frank Muther was universally respected as fire chief and his tireless leadership on the morning of the 1906 earthquake likely saved the town from widespread destruction. Even Press Democrat editor Ernest Finley, who viewed Republicans with suspicion in that era, wrote admiringly of Muther in his collection of character sketches, "Santa Rosans I Have Known:"
Frank Muther, pioneer cigar manufacturer and dealer, for years was chief of the fire department, and no matter what the hour he was always on hand when the bell rang. He was a picturesque character and in politics an ardent Republican, but with him friendship came first, even when everybody was supposed to take sides and when opposing tickets had to be place in the field as far down the line as dog catcher. Rough and often boisterous of manner, he was a real sport and an all-round good fellow. Muther was a man typical of the times. In later life he quieted down, as most men do, but he never lost his force and mental vigor. Yet despite his historical bonafides, Frank Muther is about as forgotten as anyone can be forgotten. There isn't even a headstone on his grave (he's buried in the old Odd Fellows' Cemetery lot 21, just on the other side of the fence from the Fulkerson crypt in the Rural Cemetery). Possibly there was a wooden marker originally; in the 1950s the city made an ill-conceived effort to clean up weedy undergrowth at Rural with a controlled burn which ended up torching trees, roses and many, many wooden markers. As Muther's family plot and several others in that row are likewise bare, it's easy to presume the fire must have crossed the fence. With the 110th earthquake anniversary coming up next year, some sort of tribute to that man is really overdue. The residents of Mendocino avenue were alarmed early Sunday morning by an alarm of fire which summoned the department to the residence of Colonel and Mrs. James Wyatt Oates, at the corner of that thoroughfare and Benton street. A blazing chimney was the cause of the alarm, and an extinguisher that was on hand at the Oates home and one from the fire department extinguished the blaze. There was no damage from the fire. C. S. Richardson, manager of the Reliance Automobile Company of San Francisco and his chauffeur came up to this city Sunday morning, bringing with him a Knox automobile combination chemical fire extinguisher and hose wagon. He brought it here to demonstrate it to the city council in answer to the advertisement made by the city dads for bids for one of these machines to be addd to our fire fighting apparatus. A fire in the residence owned by Mrs. Frank Graves and occupied by Mr. and Mrs. Guy Chase a few months before 2 o'clock gave the Knox automobile combination machine a chance to demonstrate its efficiency. Although starting from the engine house after the hook and ladder had left. It reached the fire first, going the long way to the fire, as the chauffeur did not know the direct route. The conflagration was a small one, but was quickly put out by the Knox chemical. Mr. and Mrs. Chase were over in Sebastopol at the time the fire started. They were preparing to move from the house, and the fire caught in some goods that were packed. The damage done was nominal. After the fire the members of the city council were taken for a ride about town by Mr. Richardson in the Knox. Mr. Richardson will be here until after the council meeting Tuesday evening. The run to the fire was made under adverse circumstances, which taken in account, makes the Knox's performance remarkable. At the time that fire alarm 16 was rung in, no one was in the machine. It waited for Fire Chief Muther and several of the councilmen and others before starting and traveled a greater distance, turning three corners to one for the hook and ladder in reaching the conflagration. The working of the twin chemical tanks proved interesting to the people of the fire department. Both tanks have an outlet into one hose that can be run into the burning building. They are so arranged that while the chemicals are being used in one tank, the other can be filled, and then the chemicals drawn from the refilled tank without any loss of time. Chief Muther and the members of the city council who saw the demonstration at the fire and who went on the ride about town on the Knox, were greatly pleased at the high grade quality of the materials and mechanical construction, and its complete equipment. Santa Rosa's new auto chemical fire engine, manufactured by the Pope-Hartford Automobile Company of Hartford, Conn., arrived last night, and is now at the Grand Garage on Main street. It is a handsome and substantially built machine, complete in every detail, and will be a valuable addition to the city fire-fighting equipment. It will be placed in commission at once. The machine was brought up to Petaluma last night by boat, and from there proceeded under its own power, the run from Petaluma being made in less than an hour. 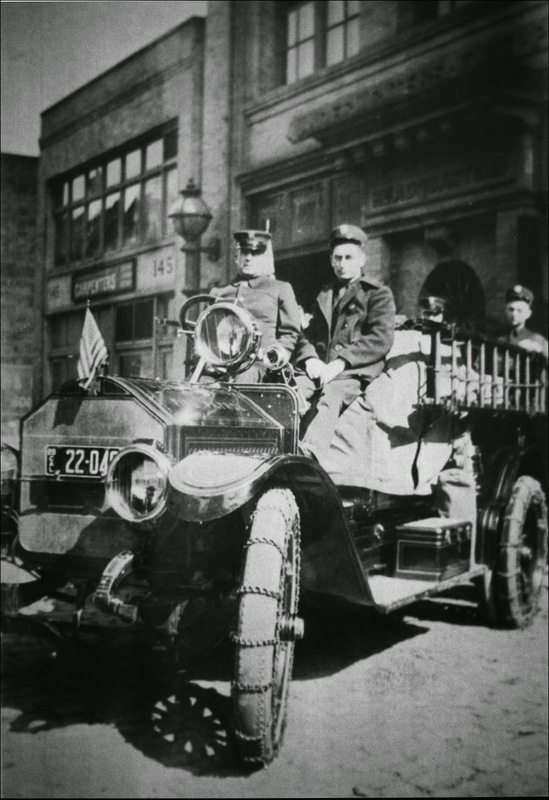 S. W. Jewell of the Consolidated Motor Car Company of San Francisco and Charles O. Buckner of the Santa Rosa Fire Department were in charge. Buckner has been in San Francisco for several days, ever since the car arrived from the factory taking instructions as to its use and handling. Buster is dead. He was run over and killed by a careless auto driver who had the entire street, and yet would not get by without killing Buster. Buster was the mascot at the fire engine house, a favorite with all who have occasion to visit the house or pass it regularly. The fire laddies amused themselves many an hour playing with the dog as he greatly enjoyed running after a stick, package or stone and returning it to the thrower with a wagging of his tail and a joyous bark. Frank Muther, Sr., who has been chief of the Santa Rosa fire department for several years past, has tendered his resignation of that position. Few men have ever served the City of Roses who have been better qualified in their respective departments than Mr. Muther, as chief of the fire department. He has been engaged in that work for many years, and has the matter of quenching conflagrations down to a science. The people of Santa Rosa have learned to regard Frank Muther as one of the most efficient chiefs on the Pacific coast, and he was always on hand where duty called, and in the thickest of the fray. At the time of the big fire here in April, 1906, he made a record for himself in the handling of the department.